If you haven’t noticed the trend towards blush pink over the past year, then you must have been living under a rock. You can’t go anywhere without seeing this soft, romantic shade of pink popping up. I’m not a proponent of completely changing your entire home just because of trends (because who the heck has the money to do that?) but it’s always fun to switch up a few accessories if a trend comes along that you really love. If you’ve been following this blog for any length of time, you’ll already know that I’m a die-hard blue girl. Every room in my home has a nod to my favorite color (and that’s what makes it feel so cohesive – learn more about that here). Saying that, this past Christmas I wanted a softer look than the traditional red would bring and so I opted for blush pink. Well folks, we are almost into February and the pink is still making an appearance in my living room and I love it! All I did was swap out a few throw pillows and switch up a couple of small accent pieces to achieve the soft vibe I was going for. And it’s so easy for you to do the same without breaking the bank, too! I’ve rounded up some of my favorite pink pieces that are not only budget-friendly but that are easily incorporated into your existing decor. Enjoy! Use these stunning mercury glass votive holders as part of your dining table’s centerpiece, on your bedroom’s nightstand or nestled into a vignette in your living room. These are the pillow covers that I purchased my living room so I can vouch for the excellent quality and beautiful color. These are an absolute steal and I might just buy them in more colors, too! Alongside pillows, blankets are the easiest way to transform the color scheme in your living room or bedroom. 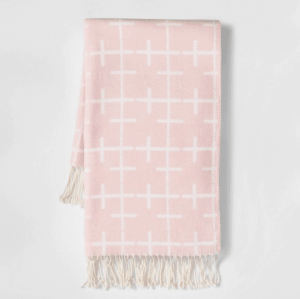 This pink beauty is currently on sale for less than $14! Pink ombre flameless candles? Yes please! Where it’s you bathroom, kitchen, living room or bedroom, these candles will add a soft and romantic ambience. Wow – this is quite the centerpiece that would be equally at home filled with fresh peonies or even as a fruit bowl in a corner of your kitchen! Organize your office, pantry or bathroom closet with these pretty blush pink organizer baskets. What’s your favorite from the products I’ve chosen? Those ombre candles are really speaking to me and you can never have enough mercury glass votives so I might just have to get those, too! !